Get ready for This Happened Rotterdam #12 at WORM! A new organisation, the same format, and the same high quality of speakers! In (western) factories there is a trend that fewer and fewer people work with more and more smart machines. Pieter Diepenmaat and his colleagues at Hoog+Diep were asked by one of the world largest beer producers to improve this collaboration with the help of smart watches. Their final solution allows the operator to work with an extensive area filled with complex, noisy, often wet machines. It does so by letting the machines indicate when they need attention directly to the operators wrist. Pieter will share the story of how they combined research into the needs of the people at the brewery with the development of new technology and how they prototype tested their way to a successful collaboration between man and machine. Ewout Nijman is a UX designer currently living and working in Rotterdam. He is an out-of-control guitar fanatic as well. Seeing both as complementary passions that feed off each other, they became an integral part of his life. 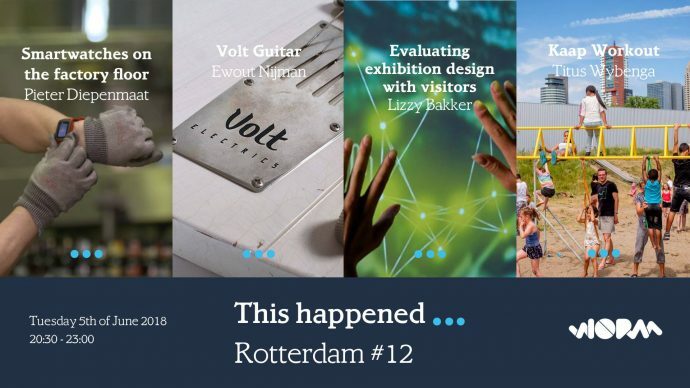 Around three years ago he teamed up with guitar maker Sander de Gier to start Volt Electrics, a new brand of electric guitars that looks to radically improve classic guitar designs. Volts first model is a tribute to one of the greatest rock ‘n roll guitars. This guitar is a new interpretation of a backwards design from the sixties where Sander and Ewout challenged each other to rethink each and every detail. Two years ago, Titus Wybenga and his colleagues at De Staalslagerij were approached by Rotterdam-based youth worker Lorenz Elstak. His goal was to involve the residents of Katendrecht in the design of a new sports route along the neighbourhoods quay. What appeared to be a straightforward job became a long lasting project with unexpected challenges along the way. A Kaap Workout festival, numerous workshops and small scale events have led to 5 “sporting spots” designed for both young and old. Titus will take us through his insights creating the Copacabana of Rotterdam. He is deeply engaged in social design and co-founded design and production studio De Staalslagerij. More info soon! Keep an eye on our Facebook event page.